Raise your hand if you hate sewing into chains. Yeah, that’s what I thought. Is there anyone who doesn’t completely dread that first row of a scarf, and having to sew into all of those pesky, tight little knots? Once you’ve got the technique down, check out these fun, FREE scarf patterns to practice on! For this tutorial, we’ll use the Double Crochet (DC), although this can be modified for single, half, etc (we’ll cover that toward the end). Chain 3. Yarn over and insert hook into third chain from hook. Now, complete the DC as normal (yarn over, draw through first two loops; yarn over again and draw through remaining two loops). Yarn over, draw through the first two loops. Yarn over again and draw through remaining two loops. Insert hook into top of first DC, draw through, and slip stitch through the loop on your hook. Ch 3 and begin next row of normal DCs (or whatever stitch you are going to do next). When you’re done with the scarf (or whatever), you can use the starting tail to sew that gap together. How awesome is that?!? If it seems labor-intensive now, just practice. Seriously, it won’t take long before you are knocking out that first row in record time. And notice how NICE that bottom edge is – no more little bumps! Just a beautiful row of loops! Chain 2. Yarn over and insert hook into second chain from hook. Draw up a loop (you will have 3 loops on your hook), then draw through only the first loop on hook. You will still have 3 loops on your hook. Complete HDC as normal (yarn over and draw through all 3 loops). Yarn over and insert hook into the loops of the last HDC. Draw up a loop and pull through first loop on hook. Yarn over, and draw through all three loops on hook. Ch 2. Insert hook into second chain from hook. 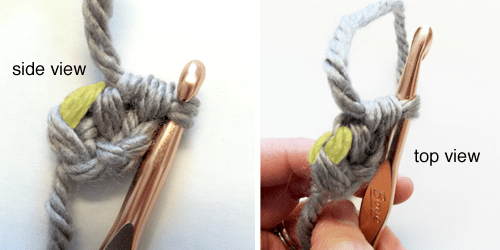 Draw up a loop (you will have 2 loops on your hook), then draw through only the first loop on hook. You will still have 2 loops on your hook. Complete SC as normal (draw through both loops). Insert hook into the loops of the last SC. Draw through both loops on hook. Yipee!!! I hated starting a project chain! So glad I was curious as to what fdc meant. Saved the day(s)! Can you do a Chainless Foundation row with slip stitches? My pattern states to do 5 slip stitches and then 5 half double crochets in the back loop. Rebecca, first let me say I have never left a comment on a blog, but I feel I must on this one. I have been crocheting for over 40 years and made everything from blankets to stuffed animals, home decor, dollies and much more. Of all the years and patterns I have seen, I have never had one that has excited me the way this one did! WOW is all I can say! This truly is the most helpful tip, instruction, whatever that i have ever seen!!! Everyone needs to know about this! Thank-you seems so small to say, but THANK-YOU!!!!!! Brilliant. I’very been crocheting for 2 years now and your instructions are clear and easy to follow and have really helped me get going. I’very Lao done a couple of your hats for one of our daughters and her friends and they turned out really well. Thank you for your great website and the help it gives to people like me. Thanks for your great instructions, the most clearly described I have seen. I will definitely try this. I’ve been crocheting for 45 years and teaching for about 35. I usually crochet into the single bottom loop of the chain which leaves the edge showing the top two strands. This way the first row looks the same as the last. Nice look but very tedious. I’m a beginner. I am trying to do the chainless foundation single crochet. I have a problem indentifying the last stitch of the single crochet. Can anyone help? I know this is an old post, but it is my go to tutorial for this chainless foundation. I watched videos and didn’t get it until I found this quick and easy tutorial. Thanks for the time you took to share this. I am left handed and the pictures aren’t helping me much, unfortunately. I have tried to imagine the pictures in figures 3 & 4 backwards from what is shown, but found this didn’t help me to envision it. It’s there any way you could put up left handed views with highlights? Please answer. I REALLY want to use this method! Fabulous! A pattern I can understand! I’ve been struggling so much with other tutorials for this stitch, and your instructions are so easy to follow, I had it down pat in minutes. Thankyou SO much for making this post, I am beyond happy to be say goodbye to trying to stitch into chains! !